Your eyes are the gateway to your soul delight them with some Chapel Time! Semi permanent lash extensions adding fabulous natural looking length and thickness to your existing lashes. Lasting up to 3 weeks with just one maintenance visit, if you keep up your infill visits they will just keep lasting for you! Great for holidays or any special occasion. Russian Eye Lash Extensions – Get the volume effect with layered lightweight lashes. Chapel offer the use of both sensitive and normal strength glues during lash extension treatments, so we can make sure we have the right one for you! Please note a patch test is required 48 hours prior to treatment. LVL Lash Lift treatment at Chapel! 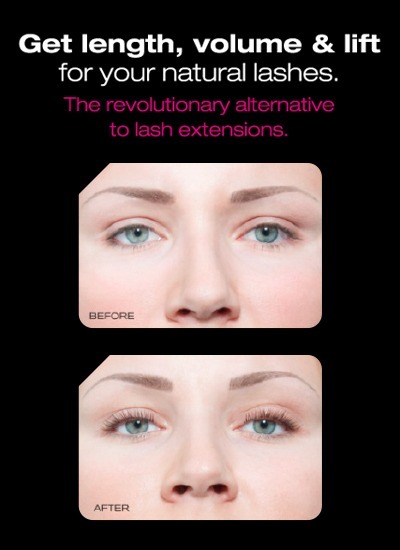 The original & official revolutionary alternative to lash extensions. Minimum fuss, maximum WOW factor. LVL lashes will add length, volume and lift to your natural lashes – without lash extensions. This lash lifting treatment creates a youthful wide-eyed look, that is low maintenace. A lash colour boost is included in the treatment to intensify those lashes. No harsh perming techniques – no frizz – we use our gentle, innovative products to lift and straighten your natural eyelashes on silicon shields, rather than a traditional perming ‘rods’. *Please note a patch test is required 24 hours prior to treatment. Contact lenses must be removed. Chapel are proud to introduce the must have celebrity eyebrow treatment suitable for everyone! Ever wondered how celebrities manage to get those perfectly formed brows? Well wonder no more! Their secret is HD Brows – A unique and revolutionary 7 step brow-shaping treatment giving you the ultimate in well groomed, high definition eyebrows. HD Brows involve a high precision procedure that will transform your brow into a perfectly shaped eyebrow, dramatically enhancing your facial features. This isn’t just shaping and tidying – The HD brows procedure is eyebrow artistry! Do I need to have great brows to begin with? Not at all whoever you are, whatever the state of your eyebrows, HD brows puts celebrity beauty within your reach and it’s also very affordable. Whether yours are overgrown or over plucked, HD Brows will sculpt your brows into the perfect shape for your face and transform the way you look and feel about yourself. Eyebrows are a vital part of your personality. Not only do they frame your face, over 70% of your facial expressions depend on them! Thats why the right brow shape and colour can take years off you. HD Brows is a seven step eyebrow shaping treatment that focuses on shape and design. It involves a combination of techniques, including tinting, waxing,plucking & threading, using specialist HD Brow products & Chapel’s professional highly trained brow specialist who will create the perfect look for you. Can I choose my own look? Absolutely! Brow shapes are tailored to the individual as they have to suit your look and personality. Your brows can be made dark or light, thick or thin, sharp or soft. Your input is crucial in deciding the best shape and look for you. Your stylist will consider your hair growth, look, colouring and face shape when deciding on your brow design. The length of time your results last depends on how quickly your own natural hair grows back and how well your hair holds the colour. On average you’ll need them done every 4 to 6 weeks.